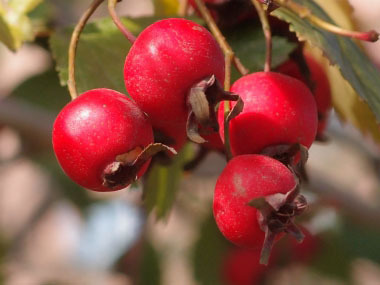 Hawthorns are a large and diverse genus in the Rosaceae family; and this genus is also very old. 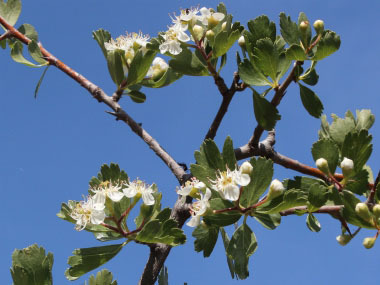 In North America, hawthorn (Crataegus mollis) fossils from the middle Miocene Epoch (15 million years ago) were discovered in the mid-1900's by a geological survey in the southern Black Hills of South Dakota.The Common Hawthorn belongs to the European and Central Asian group of approx. 100 species that are fairly easily distinguished. It often grows as a tree with a single trunk. Its flowers have an unpleasant scent. 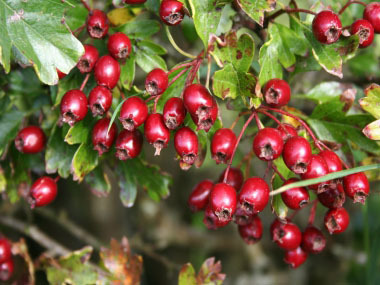 Hawthorn berries are commonly used in herbal preparations and as a nutrious source of food. Trunk/bark: There is a main trunk that on average, at maturity, can reach between 15 and 20 cm (about 8”) in diametre. Hawthorn bark is gray with shallow, longitudinal fissures with narrow ridges. In younger trees, the bark is smooth and gray, as seen on a branch of the hawthorn . As they age, the bark darkens into a shade of brown and develops fissures and ridges. Branches/twigs: Hawthorns have thorny branches. The thorns are smaller branches that arise from a larger branch, and are typically 1 to 3 cm long. These thorns tend to be sharp. This deciduous tree has alternate branching, in which the twigs (or thorns) are not directly opposite each other. 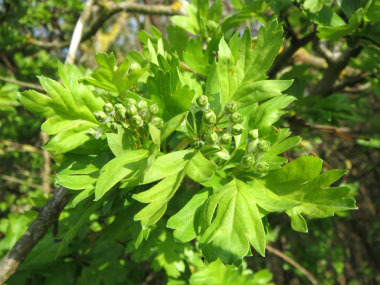 Height: The common hawthorn typically grows 3 to 6 metres (10 to 20') in height. Leaves: Leaves are stalked, broadly ovate, and pinnately lobed. The lobes are rounded, with entire margins but toothed at the tip; veins are fine-hairy. Its blade is dull on top,and bluish-green beneath. Flowers: Flowers measure about 10 mm (0.4") across. It has 5 calyx-lobes, is broadly triangular, blunt, recurved, and fine-hairy. This white flower has 20 stamens and one carpel. Bloom time is typically in June. Flowers produce an egg-shaped, red drupe. Fruit: The fruits are rounded, oblong, or pear-shaped, relatively small (the size of a large cultivated blueberry), and depending on the species, they range from orange-yellow, scarlet, red, yellow, blue or black in colour. The flesh is mealy and dry, somewhat like rosehips. Habitat: Hawthorns often grow in large, dense thickets. Generally they occur on moist, deep, fine-textured soils. They are typically found in woods and are commonly used as hedges. Native to most of Europe, North Africa and West Asia. 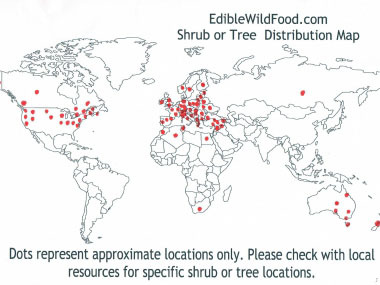 Introduced to North America and Australia. Edible parts: Leaves can be gathered in spring for use in salads or at any time (before they change colour) for teas.Flower petals can be used in salads in spring. Hawthorn berries typically taste better after a frost but can be used before a frost depending on your taste buds. Berries can be used to make jams, jellies, and in baked goods. Leaves, flowers and berries can be used to make a tea. Use hawthorn tea to make rice, quinoa or couscous.